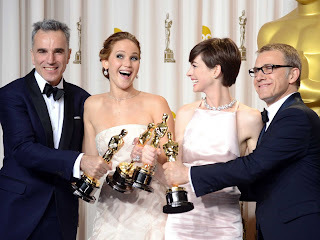 Here finally is the list of the recently concluded 85th Academy Awards or commonly known as the Oscars. 15. Original Score: Life of Pi, Mychael Danna. 16. Original Song: "Skyfall" from Skyfall, Adele Adkins and Paul Epworth. 18. Documentary Feature: Searching for Sugar Man. This entry was posted on 10:49 PM and is filed under Celebrities , Oscars . You can follow any responses to this entry through the RSS 2.0 feed. You can leave a response, or trackback from your own site.